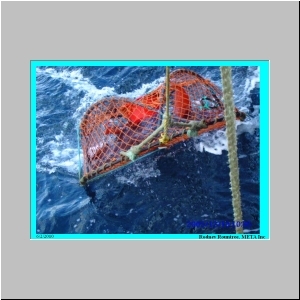 Do deepsea fishes make sounds? 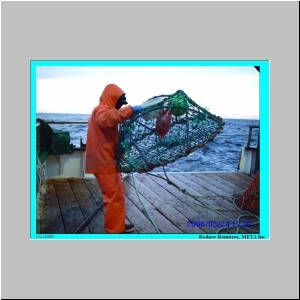 Do deep sea fishes make sounds? 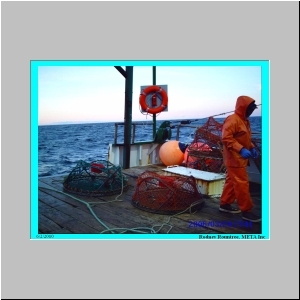 Over 50 years ago N.B. 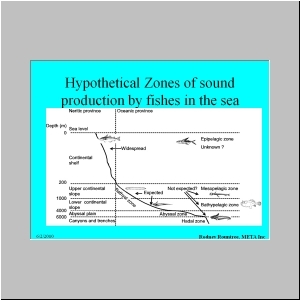 Marshall of the British Museum of Natural History hypothesized that biological sound production by fishes is widespread in the deep sea based on anatomical studies (Marshall 1954; 1967). 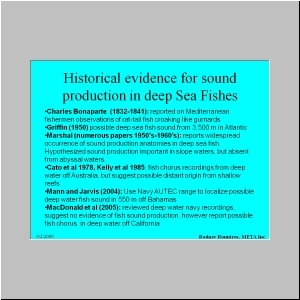 Since that time only a handful of studies have reported observations of possible sound production by deep-sea fishes based on acoustic recordings (Griffin 1950; Cato 1978; Kelly et al. 1985; McDonald et al. 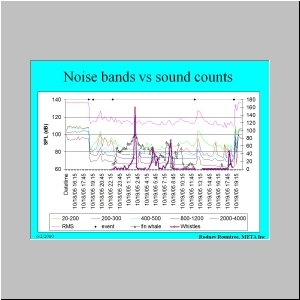 2006; Mann and Jarvis 2004), but no direct attempts to use acoustics to address Marshall’s hypothesis have yet been published (Slide 2-4). 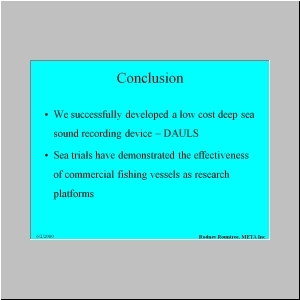 The failure of scientists to investigate the ecological importance of deep-sea sound production has resulted partially from a lack of adequate low-cost technology (Rountree et al. 2006; Rountree 2008). 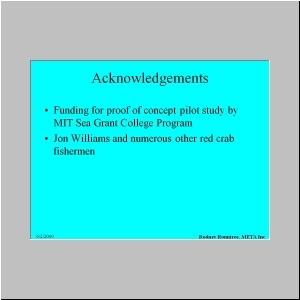 As the first step to begin to address Marshall’s hypothesis we developed a simple deep-water autonomous underwater listening system (DAULS) for use by ships of opportunity, funded by a MIT Sea Grant College Program seed grant and in collaboration with commercial fishermen (Slide 5). 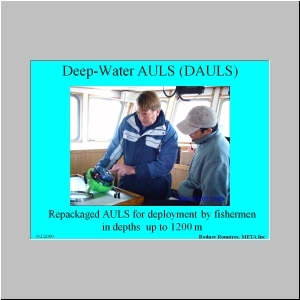 The housing for the DAULS was adapted from a deep-water trawl float (Panther Plast A/S, Vordingborg, Denmark) with a 1,800 m working depth that was split in half and fitted with an alignment groove and O-ring (Slide 8). 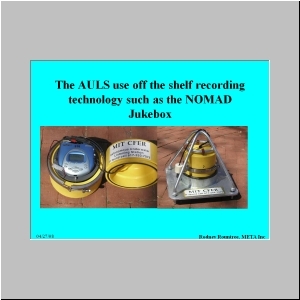 The DAULS housing contained a Nomad Jukebox® (Creative Labs, Inc., Milpitas, CA) digital recorder programmed to record continuously at an 11 kHz sampling rate for up to 60 hours (slide 9). 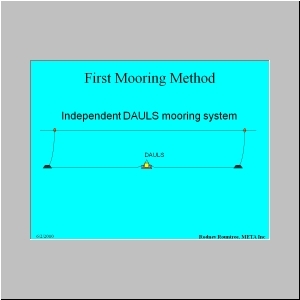 The DAULS included two HTI-96-MIN hydrophones (High Tech Industries, Gulfport, MS; sensitivity: Sensitivity -165 dB re: 1 V/?Pa, frequency response: 2 Hz to 30 KHz) mounted 1 m apart. 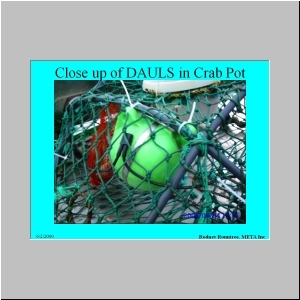 Fishermen deployed the DAULS inside a commercial deep-sea crab trap within a string of 100 traps during normal fishing operations along the shelf break and retrieved it when the traps were hauled after approximately 24 hours (Slides 10-29). 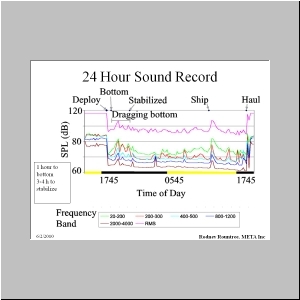 The spectral density of selected frequencies was determined at 15 minute intervals over the deployment period using the method described by Locascio and Mann (2008). 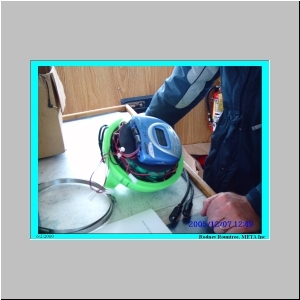 This method is particularly useful for detecting chorus sounds. 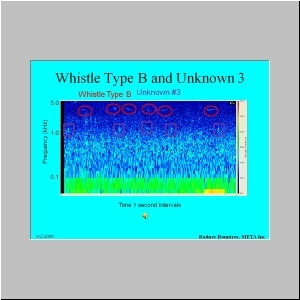 In addition, the entire recording was monitored by an observer to detect potential fish and other biological sounds. 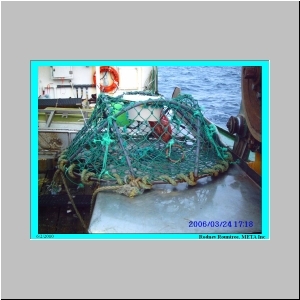 We successfully obtained a 24-hour recording on 18 October 2005 from the sea floor in 682 m of water in Welkers Canyon located south of Georges Bank (Lat. N40.0883, Lon. 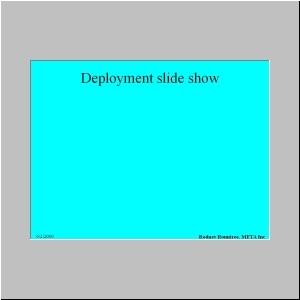 W68.53167; slides 14, 30). 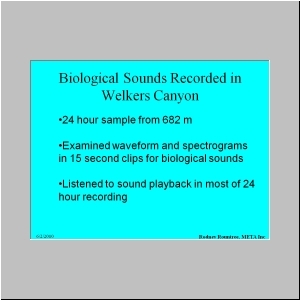 The recording contained a wealth of biological sounds including sounds from fin whales, Balaenoptera physalus (slide 31), humpback whales, Megaptera novaeangliae, pilot whales, Glopicephala spp., and dolphins (Delphinidae, slides 32), as well as frequent examples of at least 12 unique unidentified sounds that we attribute either to undescribed cetacean or fish sounds. 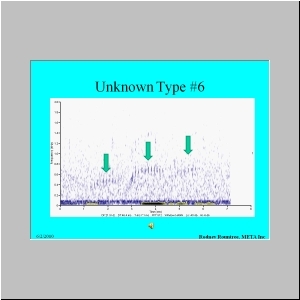 An examination of spectral density peaks within selected frequency bands did not detect chorus activity (Slides 33-37). 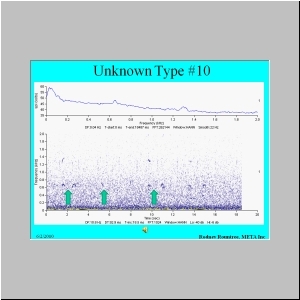 Peaks in low to mid frequencies resulted from periodic movement of the traps (dragging noise), while peaks in higher frequency bands resulted from passing ships. 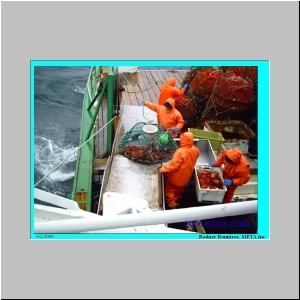 Ships that passed nearby produced strong peaks at all frequencies and completely masked biological sounds (Slide 41). 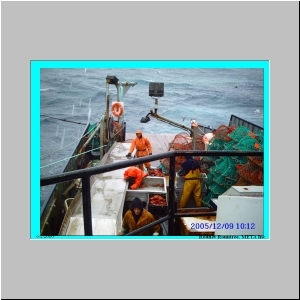 Temporal patterns in received sound levels (slide 41) provided unexpected data on fishing operations. 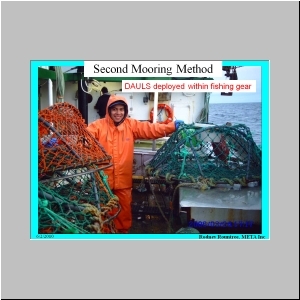 The DAULS took about an hour to reach the sea floor, and then was dragged along the bottom for another four to five hours before coming to a stop, followed by periodic dragging throughout the recording, thus contradicting fishermen’s assumptions of little trap movement after placement. 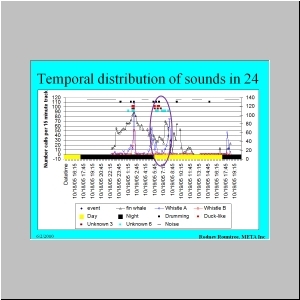 Although chorus activity was not detected, biological sounds exhibited strong temporal patterns (Slides 38-42). 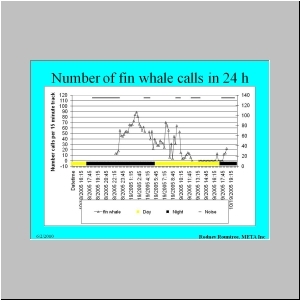 Low frequency (<30 Hz) fin whale (slide 38) and high frequency delphinid (3-5 kHz) sounds (slide 39) dominated the recording and peaked at night. 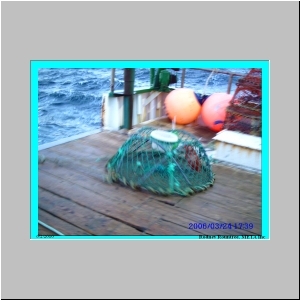 Unidentified calls could not be enumerated, but were present throughout the recordings, except when masked by ship or dragging noises (e.g., gap just before 0500 h). 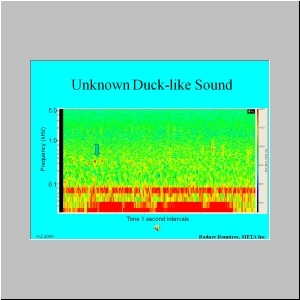 Most individual biological sound types were infrequent, but several distinct sounds labelled “drumming”, “duck-like”, “unknown 3”, and “unknown 6” occurred throughout the night and early morning hours (slide 40). 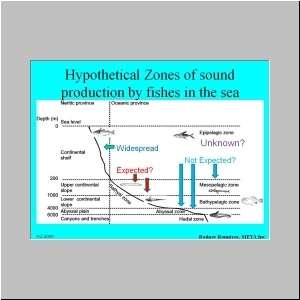 Most unidentified sounds that we attributed to biological sources had fundamental frequencies below 1200 Hz, well within the range expected for fishes. 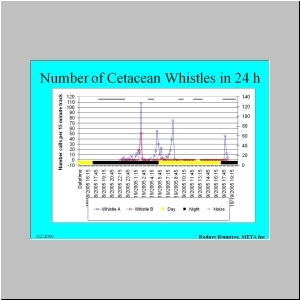 However, at this time we have insufficient data to distinguish between fish sounds and undescribed low frequency cetacean sounds. 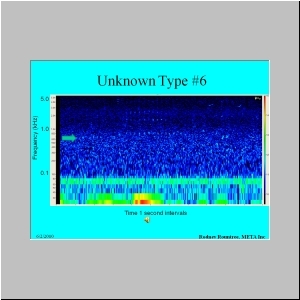 In addition we noted that most of these sounds exhibited very low received source levels and were often difficult to detect above the background noise. Rodney Rountree, Francis Juanes, Clifford A. Goudey and Kenneth E. Ekstrom. 2011. 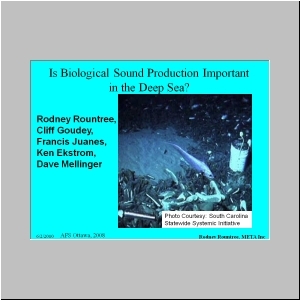 Is biological sound production important in the deep sea? 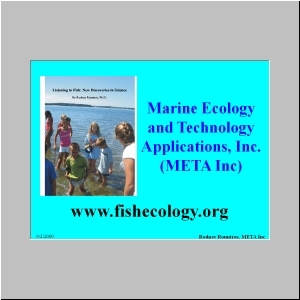 In: The effects of Noise on Aquatic Life. Arthur Popper and Anthony Hawkins (eds). 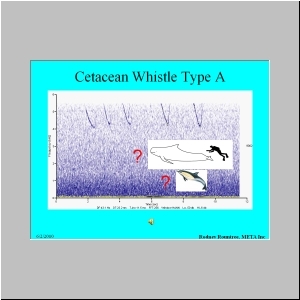 Samples of cetacean whistles and unknown deep sea sounds can be downloaded below, or click on a slide to view a sound spectrogram and download a sound clip. 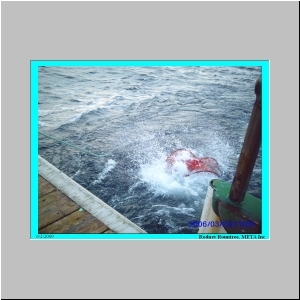 Cato DH (1978) Marine biological choruses observed in tropical waters near Australia. J Acoust Soc Am 64(3):736-743. 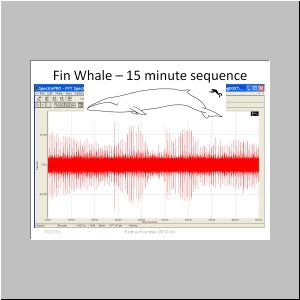 Griffin DR (1955) Hearing and acoustic orientation in marine animals. 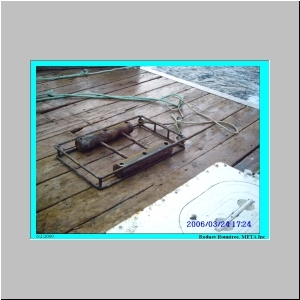 Deep-Sea Res 3(Suppl):406-417. 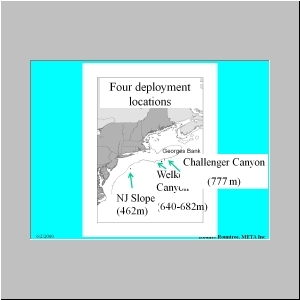 Kelly L, Kewley DJ, Burgess AS (1985) A biological chorus in deep water northwest of Australia. J Acoust Soc Am 77(2):508-511. 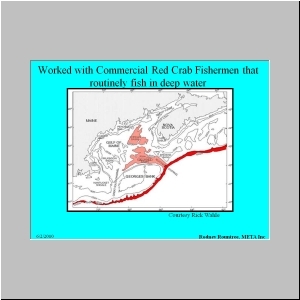 Locascio JV, Mann DA (2008) Diel periodicity of fish sound production in Charlotte Harbor, Florida. 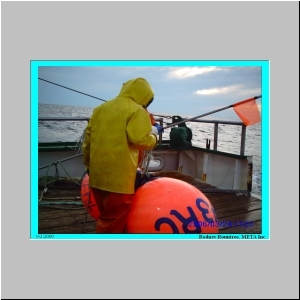 Trans Am Fisher Soc 137(2):606-615. 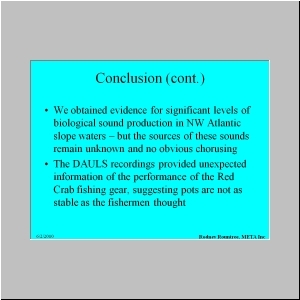 Mann DA, Jarvis SM (2004) Potential sound production by a deep-sea fish. 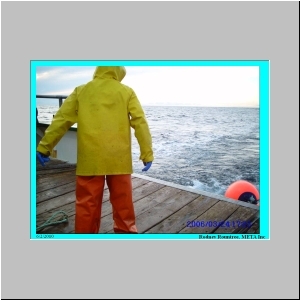 J Acoust Soc Am 115(5):2231-2233. Marshall NB (1954) Aspects of Deep Sea Biology. Philosophical Library, New York. 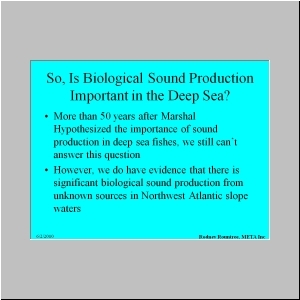 Marshall NB (1967) Sound-producing mechanisms and the biology of deep-sea fishes. 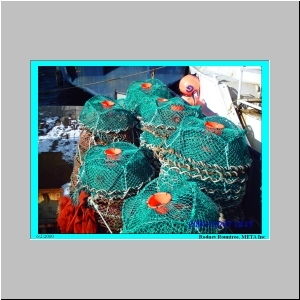 In: Tavolga WN (ed) Marine Bio-Acoustics. Volume 2. Pergamon, Oxford, pp 123-133. 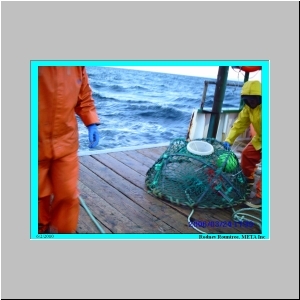 McDonald MA, Hildebrand JA, Wiggins SM (2006) Increases in deep ocean ambient noise in the Northeast Pacific west of San Nicolas Island, California. J Acoust Soc Am 120(2):711-718. 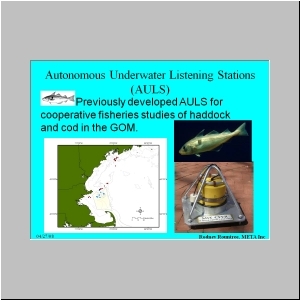 Rountree RA, Gilmore RG, Goudey CA, Hawkins AD, Luczkovich J, Mann DA (2006) Listening to Fish: Applications of Passive Acoustics to Fisheries Science. 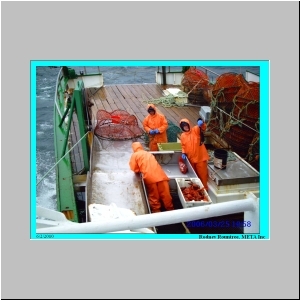 Fisheries 31(9):433-446. Rountree RA (2008) Do you hear what I hear? 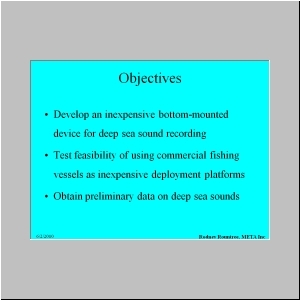 Future technological development and needs in passive acoustics underwater observation. Mar Tech Rep 51(9):40-46.